When I was younger all I made for dinner was anything with pasta and spaghetti and meatballs was one of my favorite meals. The reason was simple, the spaghetti itself was really easy to make, all I had to do was just boil it in water. The meatballs were store bought frozen meatballs, so I just had to heat them up in the microwave. And the sauce I used was also store bought. So, in less than 15 minutes I had an Italian meal on the table, it wasn’t the best nor the healthiest, but hey, it looked like the real deal. After making spaghetti and meatballs this way for years (way too long if you asked me), I went on a quest to make the best meatballs and marinara sauce I possibly could. I found a ton of recipes with all kinds of ingredients on how to make them and not one really stood out, not one. They were all pretty good but after years of making someone else’s recipes, I ended up mixing up the ingredients I liked best to come up with my own. And the result is an amazing recipe. So, what did I figure out? 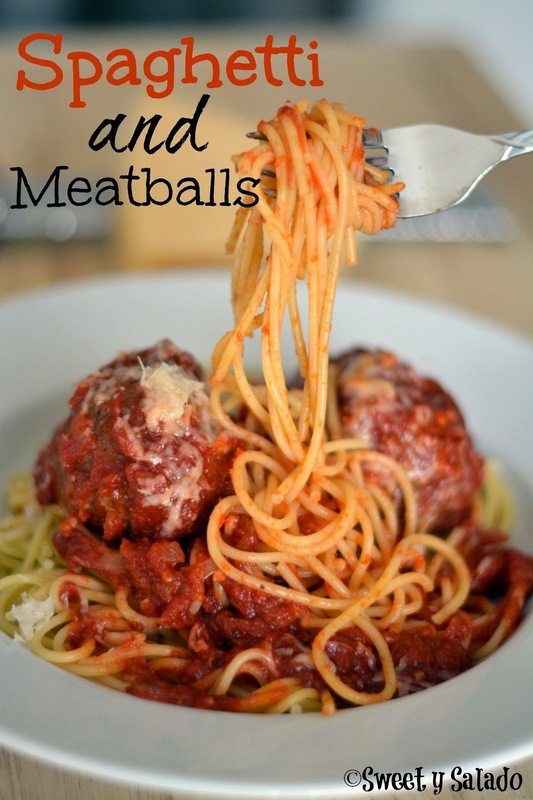 I found out that I hate the taste of ground pork and/or veal in my meatballs, so I make them with just beef. I found out that the traditional American way to make them is to add a lot of breadcrumbs, while other countries prefer not to make them this way. That adding warm water gives them the best velvety texture. That adding onions to my meatballs AND to my marinara sauce was way too much for me. And that using crush tomatoes instead of whole tomatoes makes the best thick, smooth gravy to pour all over the pasta. And yes, making spaghetti and meatballs does take a little bit of time but it is sooooo worth it! I promise! In large pot, heat the olive oil on medium heat. Add the chopped onion and cook for 5-10 minutes. Add the chopped garlic and cook for 1-2 minutes. Add the cans of tomato, bay leaves, white sugar and season generously with salt. Cover and cook on low heat for 1½ hour. It takes quite a bit of salt to season tomatoes, so taste the sauce every now and then to see if it needs more. In a large bowl, mix the ground beef, eggs, Parmesan, parsley, breadcrumbs, dried oregano, dried basil, nutmeg, garlic and season with salt (about 1-1½ tsp ) and pepper. Mix everything with your hand and then slowly add the warm water until you get a smooth texture. Using your hands, make 2 inch (5 cm) meatballs and place them on a baking sheet or baking dish lined with aluminum foil. You will end up with about 16-18 meatballs. Bake for 20-25 minutes or until cooked through. You can then let them cool completely and freeze for later use or add them to the sauce during the last 30 minutes of cooking. After 1½ hour of simmering the sauce, add the fresh parsley, oregano, basil and taste again for seasoning, if it needs more salt, add more. Add the meatballs to your sauce, cover and cook for another 30 minutes. In the meantime, cook your spaghetti according to the package instructions and drain. 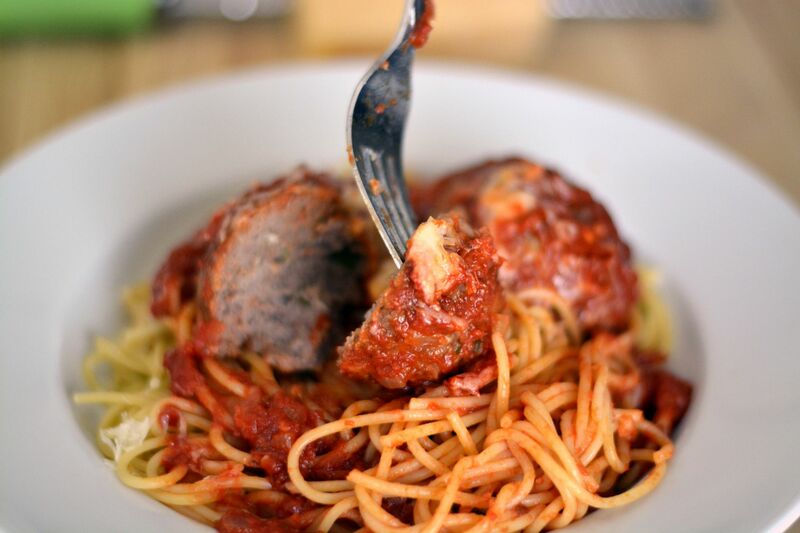 Serve meatballs and sauce over pasta and sprinkle with fresh Parmesan.